In this magisterial study, the author draws on Chen’s life and career to answer a range of questions: What did mid-Qing bureaucrats think they were doing? How did they conceive the universe and their society, what did they see as their potential to “save the world,” and what would the world, properly saved, be like? The answers to these questions are important not only because vast numbers of people were subject to these officials’ governance, but because the verdict of their successors was that they did their jobs remarkably well and should be emulated. Three persistent tensions in elite consciousness focus the author’s investigation. First, the elite adhered to the fundamentalist moral dictates of Song neo-Confucian orthodoxy at the same time that a new valuation of pragmatic, technocratic prowess abhorrent to the moral tradition emerged. Second, two contradictory views on the use of “statecraft” to achieve an ordered world were in play—one that favored the expansive use of the state apparatus, and one that emphasized indigenous local elites and communities. Finally, the subordination of human beings to the service of hierarchical social groupings contended with a growing appreciation of the dignity, moral worth, and productive potential of the individual. 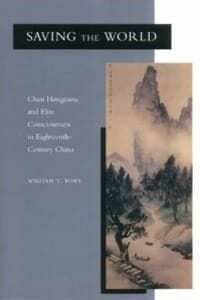 The author uses a holistic approach, attempting, for example, to explore how notions regarding gender roles and funerary ritual related to Qing economic thought, how the encounter with other cultures on the expanding frontiers helped form ideas of “civilized” conduct at home, and how an official’s negotiation of the complex Qing bureaucracy affected his approach to social policy. The author also considers how attitudes formed during the prosperous and highly dynamic eighteenth century conditioned China’s responses to the crises it confronted in the centuries to follow.